U.S. Nameplate Co. has a staff of technical professionals, engineers, and graphic artists with a wealth of experience; capable and willing to assist companies of all industries in the design, specification, and ordering of customized metal nameplates. Below, four steps describe the process of creating and designing a metal nameplate that best suits your needs. Because U.S. Nameplate Co.’s customized metal nameplates are used in industries such as construction, mining, and military, a product that is built to last is extremely important. Additional materials available to create customized metal nameplates includes aluminum, anodized aluminum, Metalphoto®, brass, and stainless steel. Each type of metal varies in thickness, color, and finish options. Once need is determined regarding customized metal nameplates, continue the process by requesting a quote from U.S. Nameplate Co. When a quote is requested we ask for general company contact information, product need & usage, and a basic blueprint/drawing of the product. It’s our job to help you customize a nameplate best suited to your needs. Request a quote online at www.usnameplate.com. At U.S. Nameplate Co., we strive to finish jobs seven to ten days after the proof is approved. In emergency rush situations, U.S. Nameplate Co. is capable of producing *Expedited orders in 3-5 business days *for a premium fee. For more information about designing customized metal nameplates with U.S. 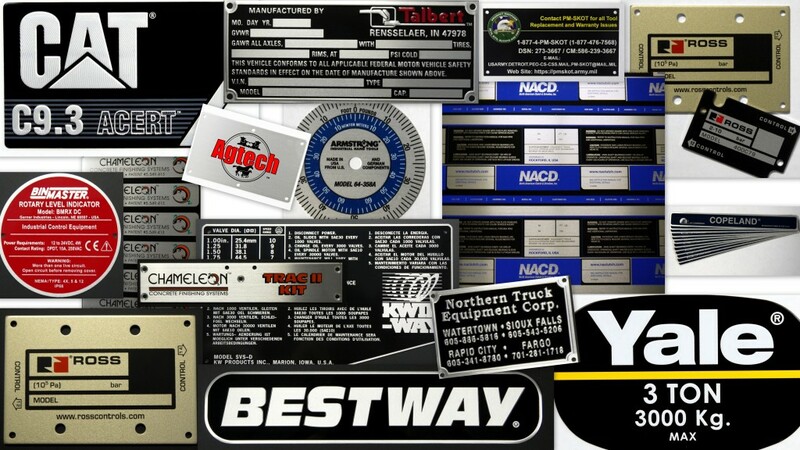 Nameplate, view our decal and nameplate design guide or contact us at (319) 895-8804.